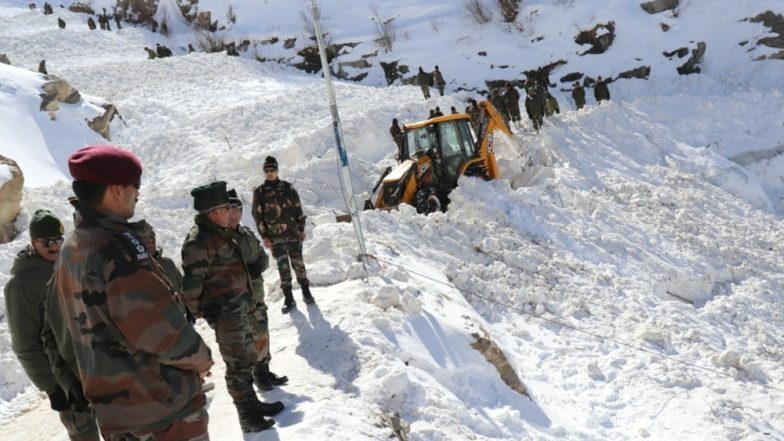 Shimla, March 2: Body of one of the five missing soldiers who was trapped in an avalanche in Namgya region in Himachal Pradesh since last 11 days, was recovered on Saturday, Deputy Commissioner Kinnaur informed. The avalanche that hit the region on February 20 was triggered by the sliding of a glacier near Namgia Dogri, bordering Tibet. According to a report by Hindustan Times, the deceased jawan has been identified as Rajnish Rishi who was on patrol along with five others when they were swept away by an avalanche. Himachal Pradesh Avalanche: 5 Soldiers Still Missing, Bad Weather Hampers Efforts. According to reports, the Army teams assisted by experts from Defense Research and Development Organization (DRDO) are looking for the other four missing army jawans. Six soldiers were buried under the snow in an avalanche on February 20 out of which, Havildar Rakesh Kumar was rescued on the same day. However, Kumar succumbed to his injuries in hospital in Pooh later. Avalanche Hits Army Personnel in Kinnaur, One Jawan Dead, Five Trapped. According to officials, a lot of snow had accumulated at the avalanche site, 350 km from the state capital, and fresh snow hampered the rescue operations. Moreover, blizzards, high-speed winds, fresh snowfall and poor visibility had been severely hampering the operations, an Indian Army spokesperson said. However, officials said chances of survival of those trapped in the snow were slim. According to a report by IANS, more engineering efforts like chain saws and drill machines have been deployed to enhance the operation.